This week's question comes from Roger, a reader of our blog. Roger, thank you for the comment. It is clear you have done a tremendous amount of research into this and are very well versed in the same types of comparisons we look at. We use a slightly different approach, where we apply various “costs per unit” of energy (kwh – electricity, gallon – propane, therm – natural gas, etc) to equations that factor in equipment efficiency to get all the choices on the same page of “cost to product one million BTUs of heat”. One of the challenges with propane and oil is that they are free market commodities that can swing pretty wildly from one year to the next. If you can consistently get propane around $1.59 per gallon, that certainly makes that a strong contender, as you have outlined. Electricity and gas are obviously regulated, so they are a bit more predictable over time. That being said, it certainly warrants a full look at any given situation to get the full picture. 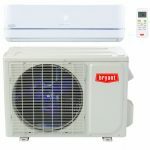 As a starting point, a heat pump is generally preferred in this area over just propane, oil, or electric resistance heat due to our electric rates. A heat pump is rated with a variety of “efficiency ratings” (SEER, HSPF, COP), but the one that is the easiest to look at is COP. This is the “coefficient of performance”, which is an exact efficiency at a given outdoor temperature. When it gets colder outside, a heat pump is a bit less efficient. Even at 32 degrees, a heat pump can often have a COP of 3. This means it is three times as efficient as electric resistance heat (baseboard or electric air handler “furnace”), or uses one third of the electricity. If you apply that to your math, you will see why heat pumps are more efficient that propane. With our fairly consistent electric rates, it would take propane dropping below $1.00 per gallon to be cheaper than a heat pump. The second part of your question is around the “back up” heat source – propane vs. electric resistance air handler “furnace”. You need one or the other (or a gas furnace) as the fan the heat pump hooks up to and as the back up heat source for when it drops below roughly freezing. Since you can add a heat pump to either, this is point of personal preference. Some people live in areas or have had experiences where they can’t get propane consistently and affordably, so they prefer the predictability of all electric. Other people live in areas where there is not good place for a propane tank or they don’t want a tank on their property. However, in circumstances as you have outlined, a propane furnace as the “back up” may be the best choice. You can much more easily use it with a generator when the power is out, and if you can get affordable propane, it is indeed more efficient than “electric resistance” back up. In a case like yours, it is very likely we would suggest a heat pump with a propane furnace as a very viable solution to consider. 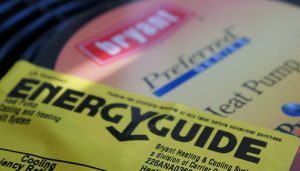 The trick beyond that is choosing which furnace and heat pump – as there are many choices of each and how they match up. For that, we offer free in-home estimates, no obligation, so we can better match them with your specific home and other possible preferences. When the outside temperature drops below 32 degrees I turn on my gas fireplace as a supplement to the heat pump. Is that a good idea or should I just let the back up electric heat in the handler kick in? Your fireplace should only be used as supplemental heat to keep the area near it warm and should not be run for extended periods of time to heat your home. 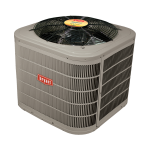 Your heatpump should be setup so that when it reaches the lower temperature limit it kicks into auxillary heat mode and activates your gas furnace or electric air handler. Your furnace or air handler will then run to keep your home at the temperature set on your thermostat. This is how your equipment is designed to work. If your heatpump is not automatically kicking into auxillary heat when the weather gets that cold we would strongly suggest setting up a service appointment to see if there is an issue. There is a $99 plus tax charge for a service appointment. If there were any repairs needed our technician would quote you for those repairs and with your approval complete the repair on site unless there were parts that needed to be ordered. In that case we would collect half down for the repair and return to install the parts once they arrive.